Directed by Sameer Khan and Producer Jayant Ghosh, J.R. Production House hosted Trailer & Song Launch of the Film “Tishnagi”. The film brilliantly shows the impact of cheating in love by a beloved one and what one does in such condition and how one survives. While they flaunt the tiara of fame and popularity, Mumbai’s glamour and music brigade showed up in number at the Trailer & music launch of the film “Tishnagi”. 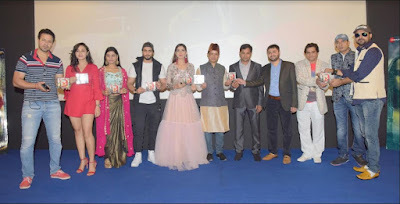 Renowned names from Film & Music industry were the biggest attraction at the high Trailer & music launch of the film “Tishnagi”- Aryan Vaid, Sameer Khan, Tabish Sulamani, Anushka Shrivastava, Kaveri Priyam, Sapna Rathore, Manzar Balyavi, Qais Tanveer, Kalim Khan, Tabish Sulamami, Gufy, Jayant Ghosh, Sameer Khan. And further talking about the movie, director Sameer Khan & producer Jayant Ghosh stated "The story & music of the film is one of its USP's. The album of the film has something for everyone, from party songs to romantic tracks. Looking forward to the response from the audience"
Whereas, Aryan Vaid said "The storyline is brilliant. The star cast is outstanding, all of them have done a fantastic job, the film looks amazing. When the director narrated the role to him, I was very impressed. Parts of the film are shot in Mumbai & Bhopal. I am very proud to be a part of this project." Well, featured under the banner- J.R. Production House, the movie cast, Aryan Vaid and Rajpal Yadav, Kainaat Arora, Anushka Srivastava, Qais Tanveer, Kaveri Priyam, Sapna Rathore in prominent roles.